The FIDE World Chess Cup got started a couple days ago in Khanty-Mansiysk, the little-known Siberian city that has become the de facto world capital of chess in recent years. As usual, it is being held in knockout format. Each round is a mini-match of two games of standard chess, followed in case of ties by a series of progressively quicker playoff games: two 25-minute games, two 10-minute games, two 5-minute games, and finally an Armageddon game. Partially because of the complete insanity and unpredictability of two-game matches (not to mention five-minute Armageddon games! ), the World Cup does not have the prestige of the classical world championship. However, the top three finishers will get to play in the next Candidates’ Tournament to select a world championship challenger. Thus, paradoxically, the playoff match for third place may well be more important than the match for first place. The two people playing for first place will already be in the next Candidates’ Tournament, and they will “only” have the less prestigious World Cup at stake. Chalk up another prize for FIDE illogic! What? No Hikaru Nakamura? Well, perhaps he read my comments above (see “insanity” and “unpredictability”) — in any case, he opted not to play. And the results: Ivanov, our lowest seed, upset Hao Wang of China (#17), 2-0. Shankland upset Peter Leko of Hungary (#18), the man who came within one game of winning the world championship a few years ago, 1Â½-Â½. Onischuk beat Ivan Ivanisevic of Serbia (#78), 1Â½-Â½. The remaining three U.S. players all tied their matches 1-1 and are headed for playoffs tomorrow. I think that Shankland’s upset over Leko caused the greatest sensation, because Shankland is such a new name on the world chess scene and because Leko is considered such a super-solid player. Remember that it was just over a year ago that Sam threw a temper tantrum and said he was quitting chess because he had been unable to qualify for his third grandmaster norm. I’ll bet Leko wishes that he had stayed retired! Shankland beat him as Black, in a game where Leko actually had a small advantage most of the way, but tried a little too hard to win an endgame that was probably drawn. I haven’t gone over the second game, but it sounds as if it was exciting, as Leko tried all-out for a win and failed. According to the ratings, Ivanov’s 2-0 thrashing of Hao Wang was an even bigger surprise. I think the only reason that people aren’t making a bigger deal of it is that it’s hard to tell just how strong the Chinese players are; they have not yet made it into any of the World Championship matches or even into the qualifiers. The only loss for an American player so far was Kamsky’s loss to Diego Rafael Di Berardino of Brazil. Kamsky had won the first game, so that allowed Di Berardino to tie their match. If the Brazilian could somehow win the playoff, it would be truly a monumental upset and certainly the biggest surprise of round one. Presumably, though, Kamsky’s greater experience will stand him in good stead and he will find a way to win. The reason you’re not seeing much about Ivanov beating Wang Hao is that Wang didn’t go to Khanty-Mansiysk due to health problems and forfeited both his games. Thanks, Dan! I’m embarrassed that I missed that. 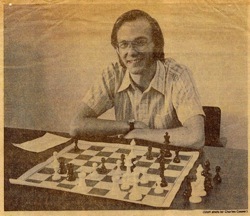 I did see Wang’s health problems mentioned on chessbase.com, I think, but I didn’t make the connection that he was the player who was supposed to play Ivanov.